It seems that no matter how much space we have, we can all use just a little bit more storage space. 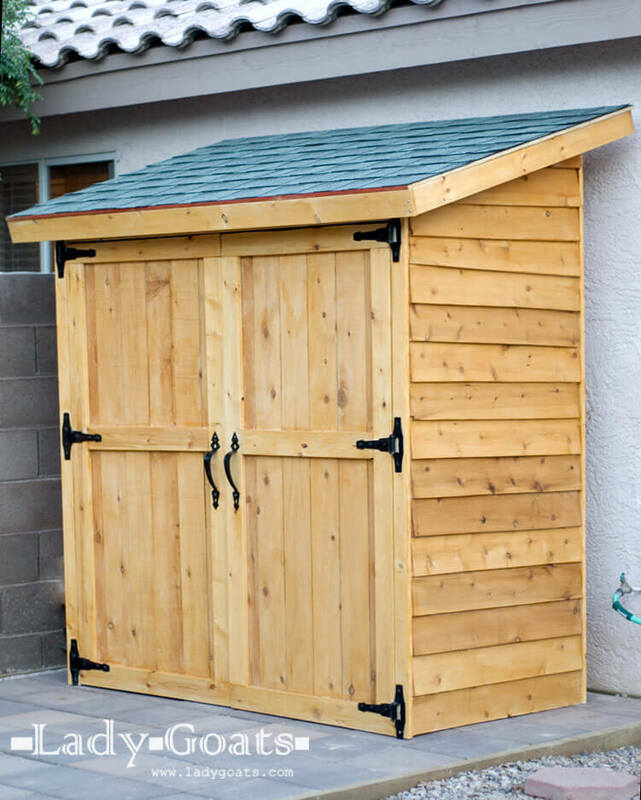 I have used up every inch of spare space in my home, so I decided to come up with some small storage shed ideas for my yard. These projects are simple to complete, and they will make a great addition to your home. I think that a large shed is tacky in my yard because I do not have that much space, which is why these ideas are perfect for my needs. These designs do not overtake my lawn, but they are still big enough to store my family’s bikes, the garden tools, and even the trash bins. In this guide, I will show you 27 unique small storage shed ideas that you can make your own. In the gallery images, you will see that many of these projects have a wood finish that is sealed and protected from the rain, but if you want to add a splash of color to your garden, paint it and make it your own when the shed is complete. 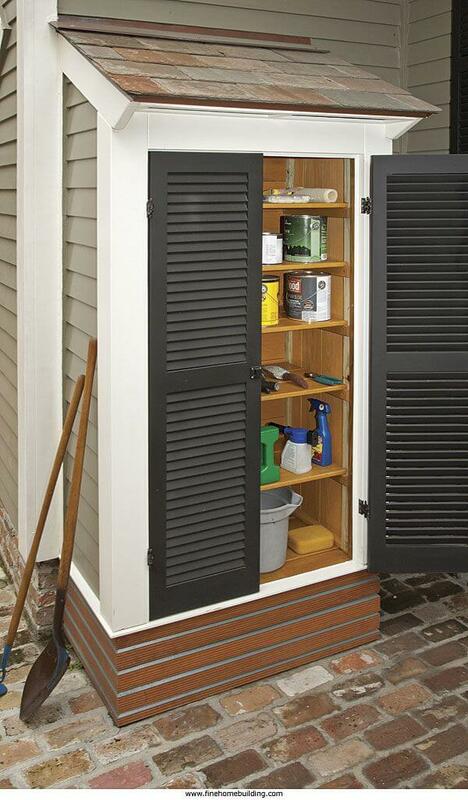 Think of this storage solution as an extension on the siding of your home. It’s meant to blend in, and with the neutral colored panel design on the exterior of the plastic doors it will camouflage quite nicely with most homes. The options to open the door from the top or the front adds a unique versatility. If your style profile tends toward shabby chic or farmhouse this is a beautiful storage shed solution. 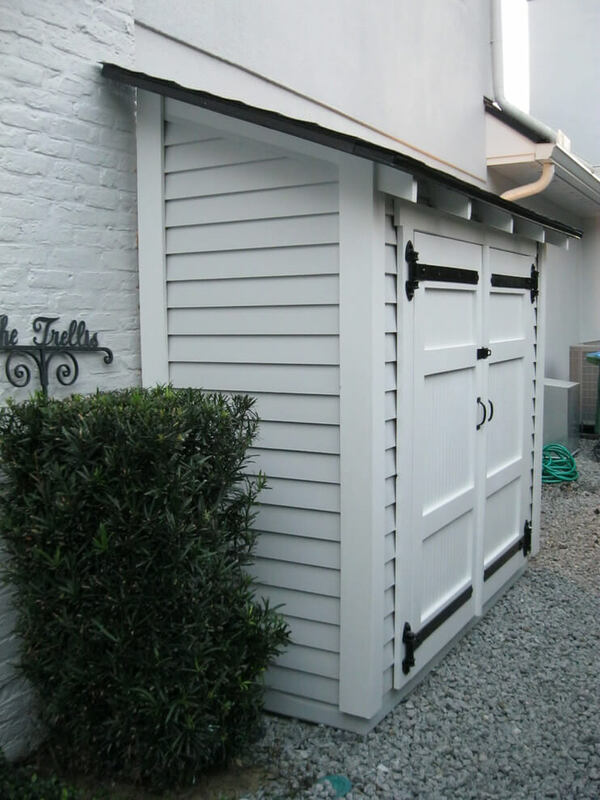 The quaint shape, white color, and French door make this a storage shed that is meant to stand out, not blend in. 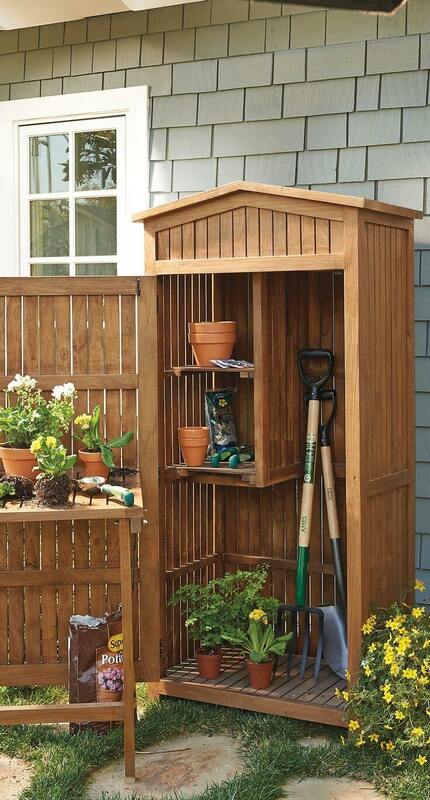 The size and shelving space on the interior make this perfect for garden tools and seasonal yard ornament storage. When you need more space in your storage shed, it’s nice to have one like this that’s attractive. If you can’t avoid looking at it you should like what you see! This wood-paneled shed has a cute tin “roof” and charming cast iron accessories in barn door fashion. The wood has a warm mahogany colored stain which contrasts nicely with the neutrals and greenery. Clever storage isn’t just for your kitchen! If you’re short on space or just need some added security, this nifty outdoor drawer is for you. The sleek wood paneling and grass rooftop are modern features that also blend well with natural surroundings. No one will be the wiser that you’ve got valuable outdoor items like sports equipment stored away. Your green thumb deserves a greenhouse, and this is a lovely choice. 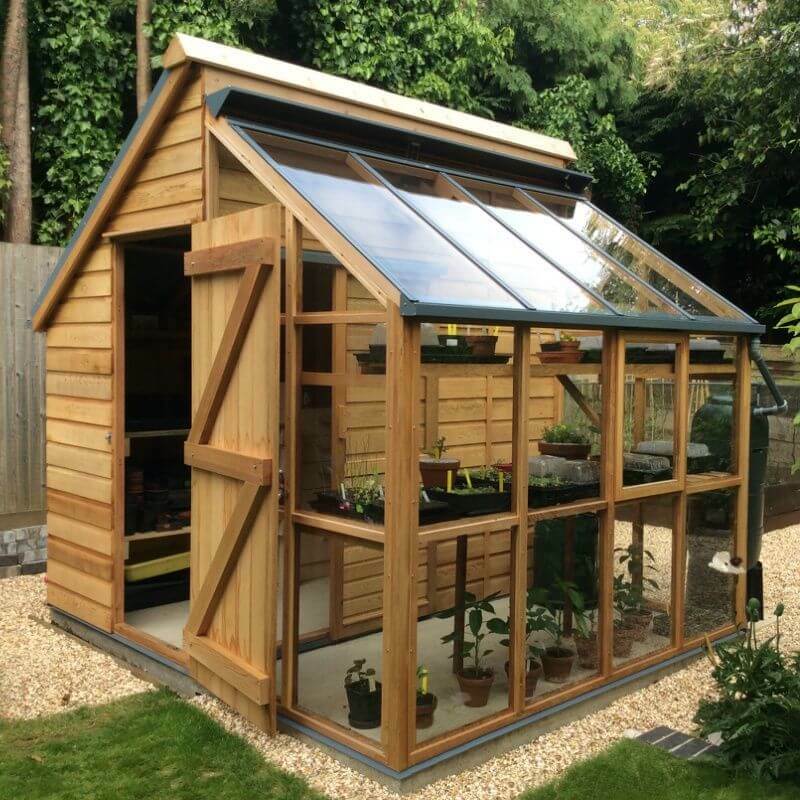 This combo storage shed and greenhouse has enough space for a nice menagerie of plants and storage for your yard items. The slanted roof maximizes storage space. The maple finish with clear glass panes around the greenhouse is just beautiful. 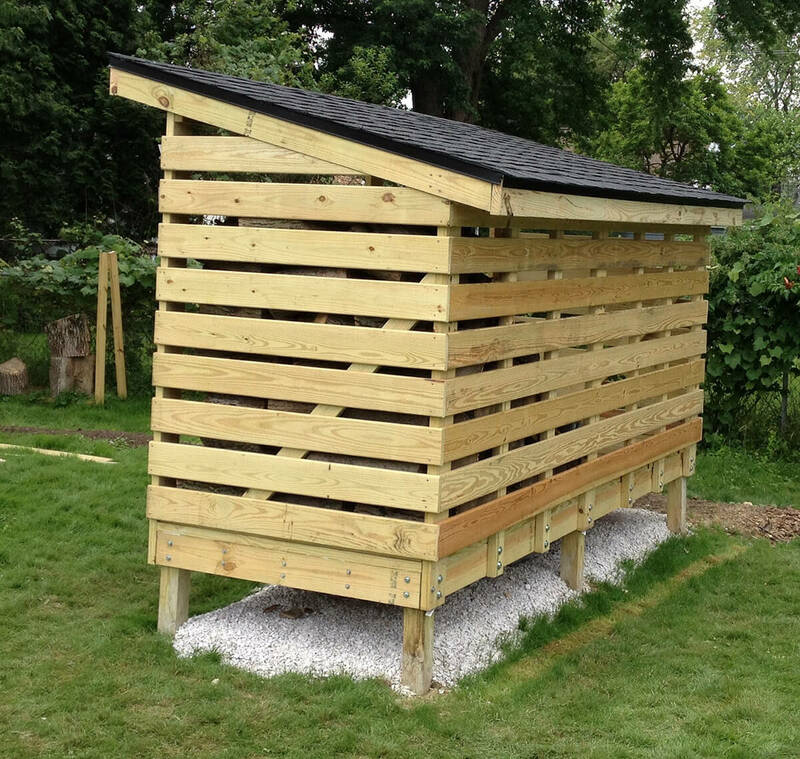 Raised storage is a great alternative to an enclosed shed for storing things like animal feed, potting soil, or other items that can get moldy or mildewed on the ground and that critters like to get into. The open slats on this design also allow for great airflow to keep your contents nice and dry. 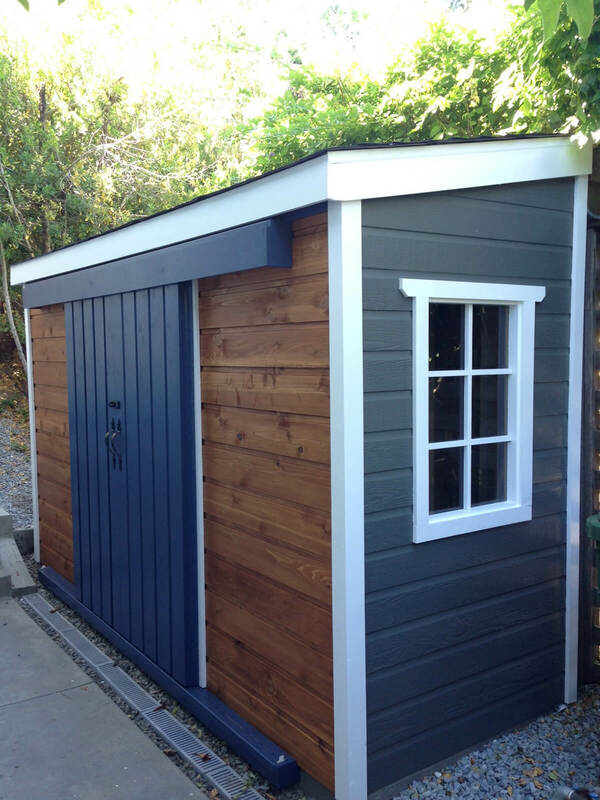 Painting a storage shed the same color as the exterior of your house is a great way to add a faux renovation. 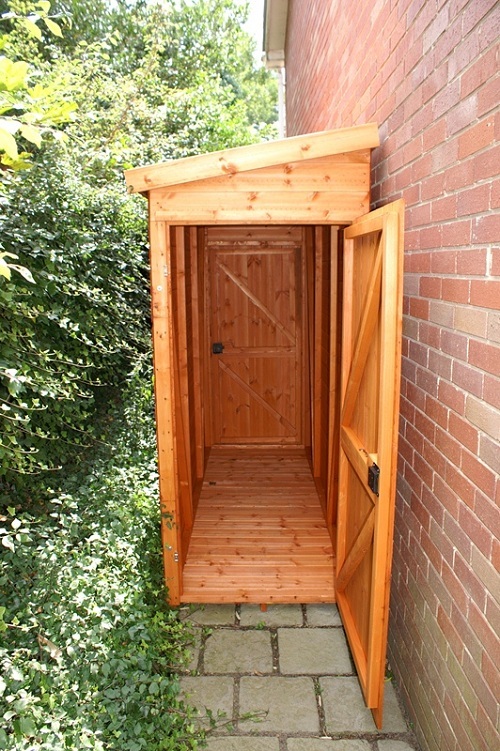 It gives the appearance of an attached storage space, but in fact, it’s a standalone shed! This version has finishing touches like framed corners and decorative ironwork on the doors. Sometimes function wins out over form. 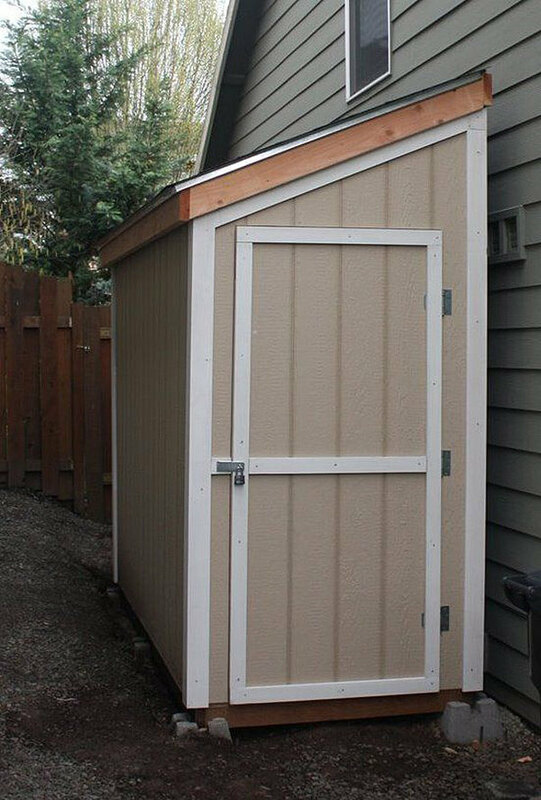 This simple shed is roomy and protected from the elements so that all of your tools and toys have a shelter. 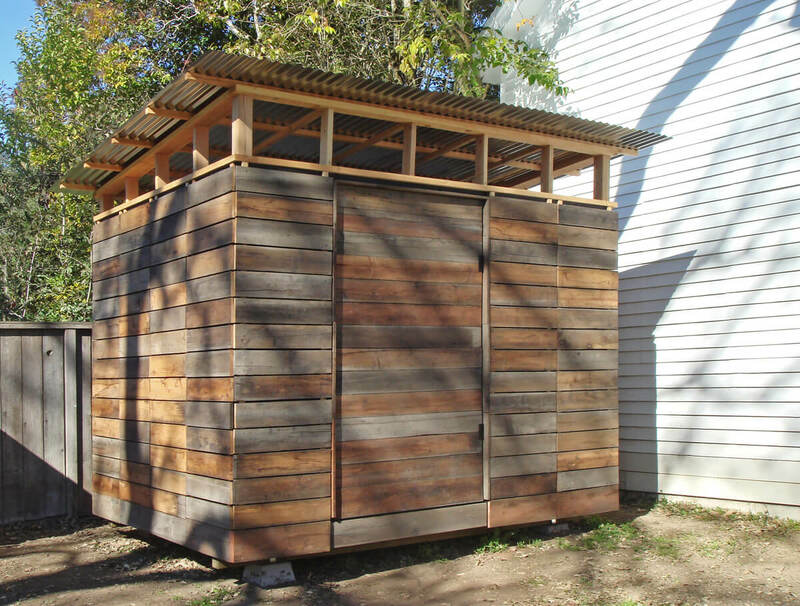 The raised build keeps the shed cool and protected from moisture. The openings at the top allow air to circulate. Tight wooden slats keep your clutter safely out of view. 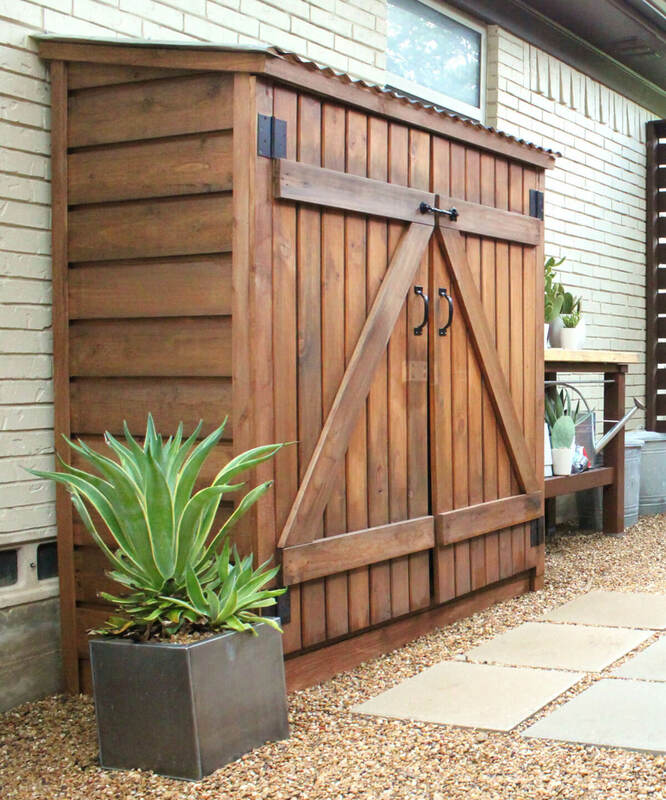 If your backyard is your oasis, then you should have a storage shed to match. This is pure whimsy from top to bottom! From the layers of color, the tiered and embellished top, the bright yellow double French doors, the emerald green shelves inside, and the brick floor. Shelves and cabinets offer nooks and crannies for your tools. Adorable! This design is great for modern palettes. The combination of charcoal gray, white, and natural wood finish is sleek and clean. The sliding doors are a nice touch that is space efficient and provide easy entry. The pebbles and slats under this storage shed are great for drainage. This pine shed is like a tiny cabin for your backyard. It’s attractive and bright. The slanted roof has thin shingles that give it a finished appearance and lets rain or snow roll right off. While this isn’t large enough to fit large equipment like a lawnmower, there’s ample space for tools and small motorized tools like edgers and chainsaws. Trash cans? What trash cans? 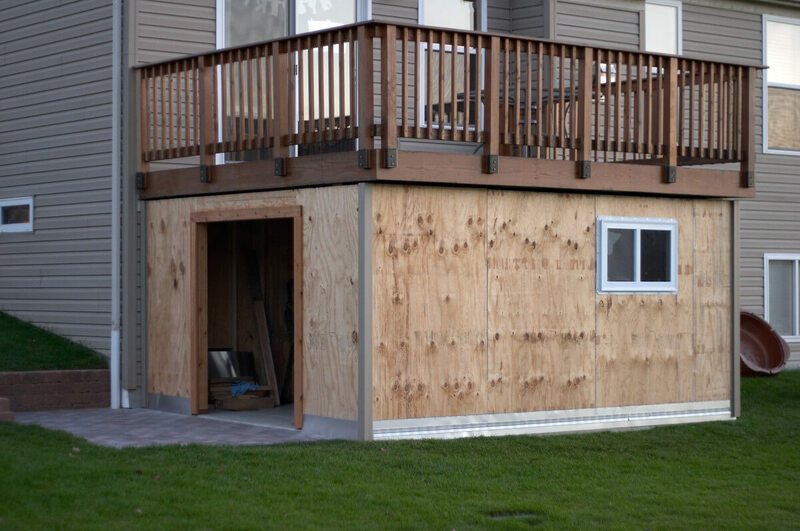 Cure your yard of this common eyesore with a handy storage shed. The side panel doors allow you to roll the bins out on trash day. 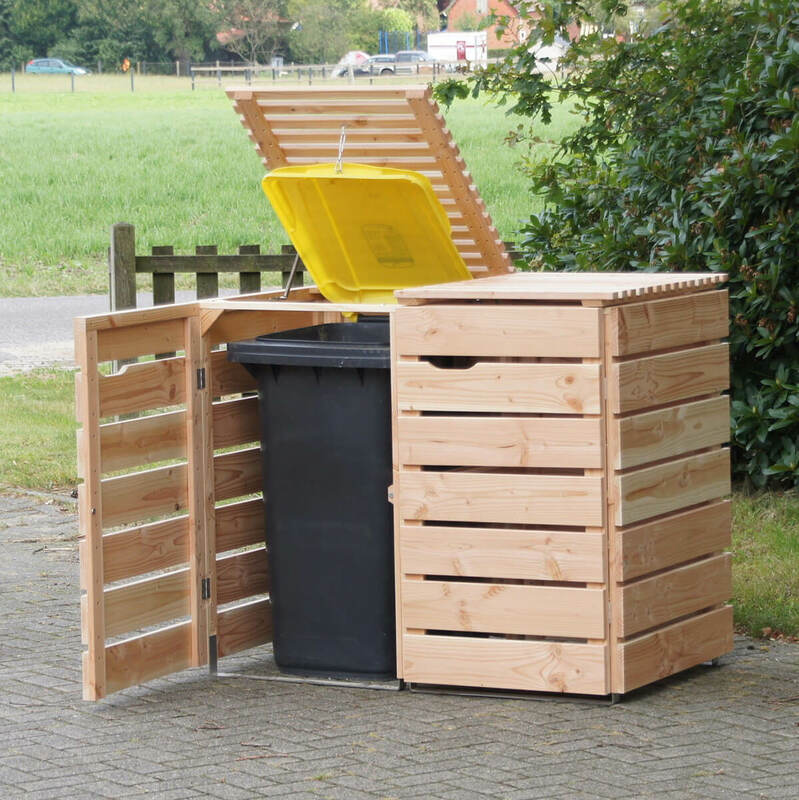 For every other day of the week, attach the top of the bin to the wooden lids so that you don’t have to touch the trash can to toss your garbage! 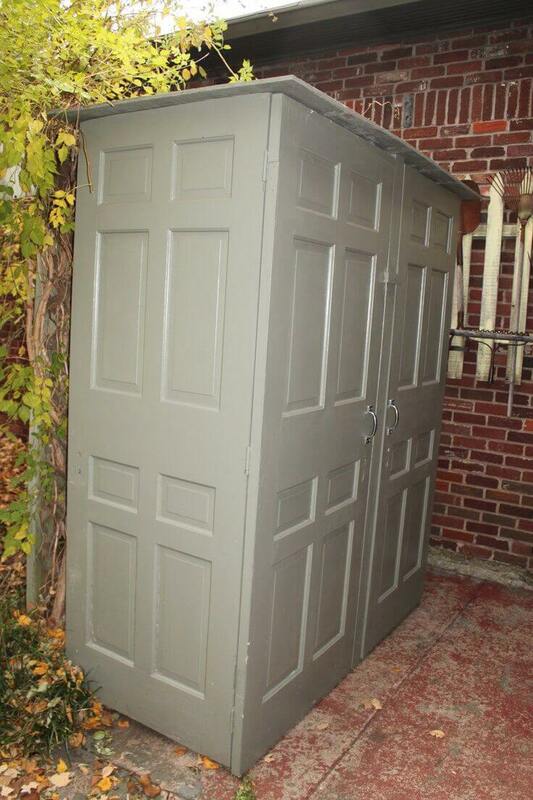 This is the perfect little storage shed for a gardener. The tall design gives ample space for shovels and spading forks, but the shelving on the side maximizes the design so you can store smaller items like pots and seeds. You can even fit potted plants and bags of soil under the shelves. The best part is the Murphy bed style drop down side table in the door. Open it up while you’re working and fold it up to shut the door when you’re done. When you have a small yard you’ve got to make the most of every square foot, and this innovative design really delivers. The tall design is wrapped in wood slats for a modern feel. Its tall enough that you can fit a bike or trash bin out of view. 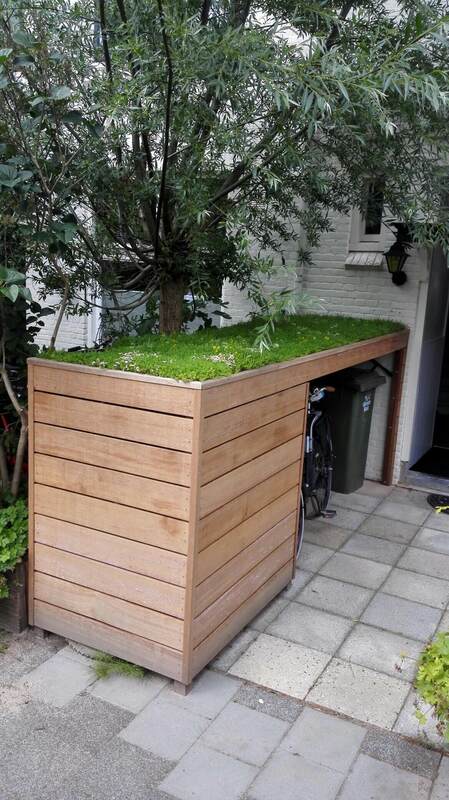 Best of all, the top of this storage solution is a raised garden bed so you don’t lose any green space. When the spring season begins you want to squeeze every last drop of sunshine and warm weather out of the season – so build yourself a room outside. Think of it like a treehouse for grownups. A large space will give you enough room for simple furniture and doors and windows on each side of the shed can be opened up for crossflow. Do you have one of those awkward spaces outside your home that isn’t particularly useful or used? A small wooden cabinet like this is a great way to make it functional. Custom built to the width of this space, this cabinet can be accessed from either side and is tall enough to fit items of all sizes. What this storage solution lacks in size it makes up for in cuteness. The creamy white color, charming French door, and adorable window frame rooftop look right at home amongst the flowers. The antique doorknob is an especially nice touch. 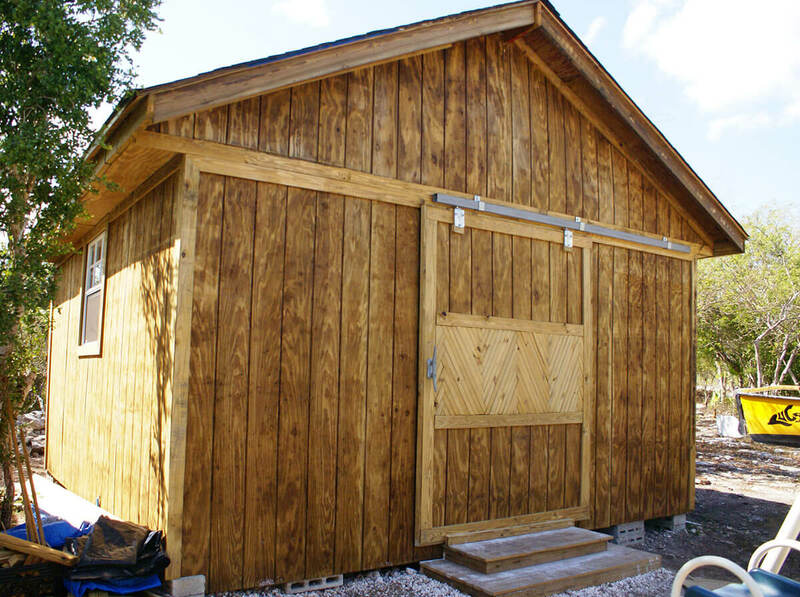 Since this type of storage shed is meant to be seen, add a seasonal wreath as a focal point. This is just your basic, functional shed. The 10×10 size is plenty of space for you to park and store all of your yard and garden tools. The simple wooden design is classic and attractive. Fully opaque siding is a nice security feature and you can add a lock to the doors as well. This beautiful storage cabinet has one side of shelves for smaller items, and one side without for larger ones. The wood has a beautiful honey-colored finish. The barn door style construction with iron accessories is both simple and elegant. The tiled slanted roof complements the rest of the design. Custom storage space is wonderful because it’s an extension of the exterior of your home so it blends right in. You can see that in the perfectly matched siding and corner frames on this storage cabinet. Even the roof shingles can be matched to your home! Classic black shutters conceal the storage shelves inside. An under-the-patio shed solves two common problems. First, it basically adds a room-sized storage space to your backyard. Second, it handily conceals the scaffolding required to support an upstairs porch. You can easily finish the wood to match the exterior paint or the color of the patio wood so that the finished design blends nicely with the rest of your home. No matter how messy the contents are inside, a storage shed always looks chic with a pop of color! 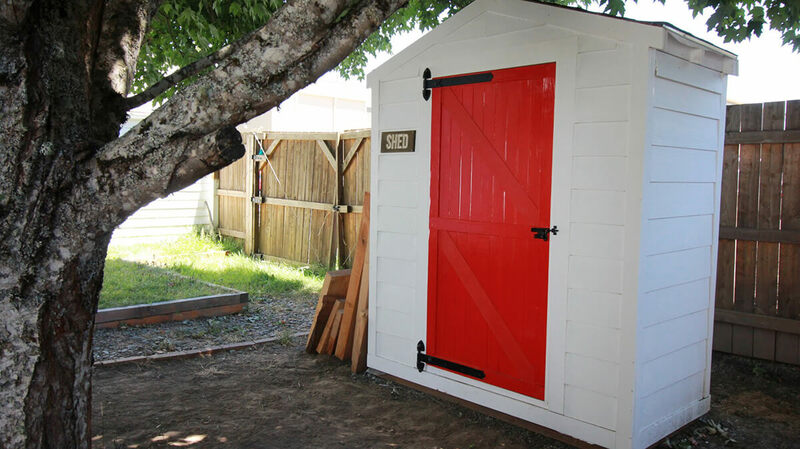 This cute little shed is pretty simple, but that poppy-red door bumps it up a notch. The cute “shed” sign is also a nice touch! Whoa! This is the mother of all storage sheds. With space like this, you can stow away large items like lawnmowers and small tractors as well as your small tools and trinkets. The large sliding barn door gives plenty of clearance. A big shed like this would also make a great woodworking or craft area. Reduce, reuse, and recycle is the name of the game. 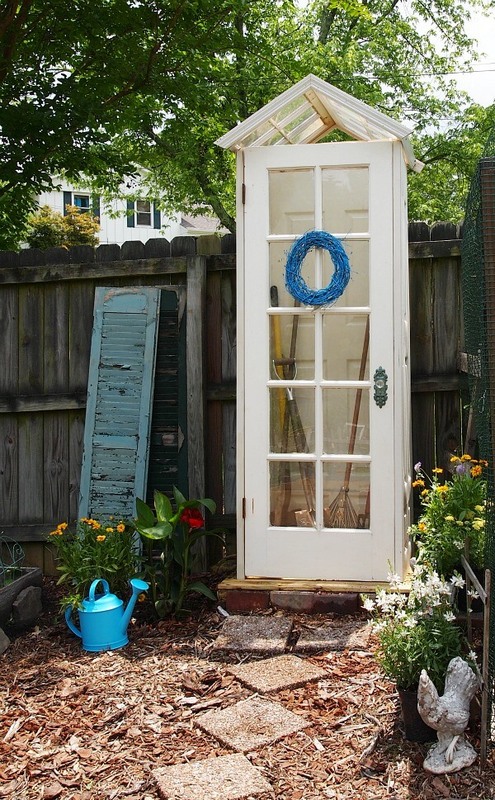 This is a great way to “upcycle” old doors into a clever and attractive storage shed. 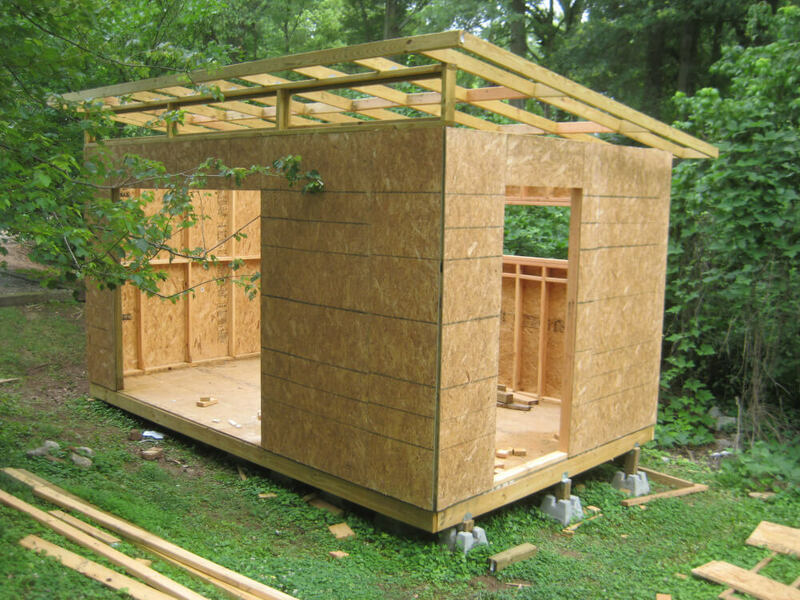 You’ll need 6 doors and a sheet of particleboard for the roof. Paint all the pieces to match. Connect the back and side panels with brackets, then add the front doors with hinges. Sometimes you just need an outdoor shelf. 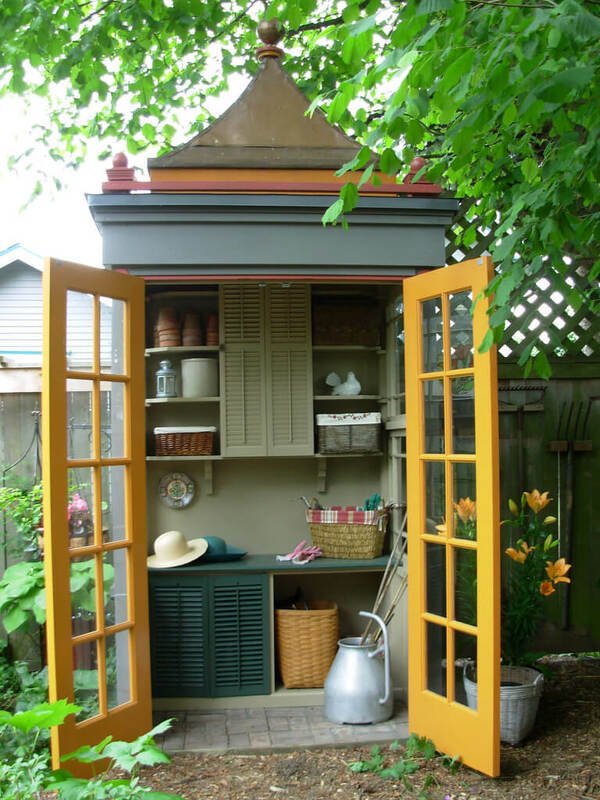 This simple idea is a great way to give yourself some outdoor storage in a compact design. The elevated slats keep your items off the ground. To maximize space one side has a shelf in the middle, while the other side is open to accommodate taller items. 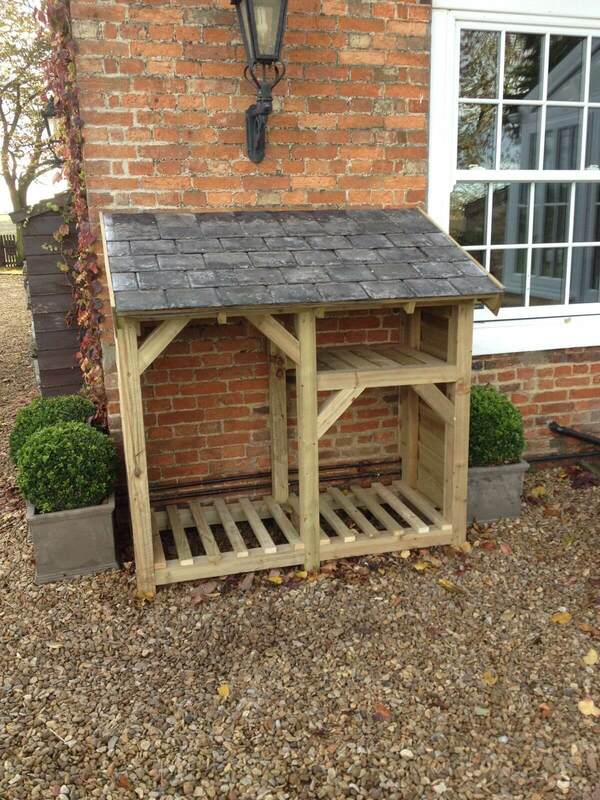 The slanted roof will protect your stored items from the elements. It is flat out amazing what you can accomplish with some strategically placed bricks and wood. Ever wanted your own smokehouse or pizza oven? Look no further than your backyard! A custom shed can store your firewood and set you up for some epic culinary creations. Just be sure to use the necessary precautions with finishing to avoid a fire hazard. If you’ve ever had a toy or tool mysteriously disappear from your yard then you’ll appreciate a simple shed with a security feature. 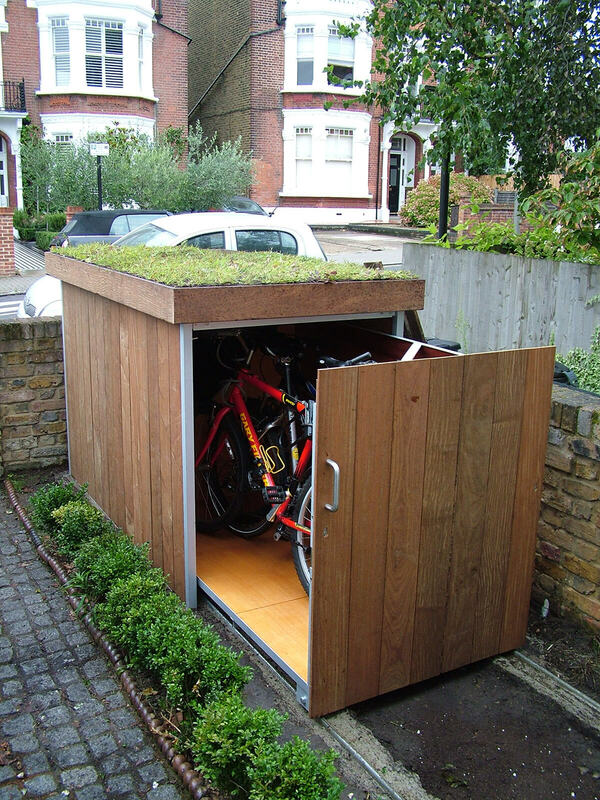 A small shed like this can fit a couple of bikes and tools, and the lock can help keep them from wandering off.